Amalie continues over 100 years of excellence with a full line of Automotive, Fleet, Industrial, and Specialty lubricants, that, since 1903, truly are...Better than they have to be! Founded in 1903, Amalie quickly developed a reputation for high-quality, well-engineered petroleum products. In 1953, Amalie was the first oil company to introduce a multi-grade motor oil: Imperial 10W30. Through the years, Amalie has continued to innovate with synthetic oils, high-TBN fleet lubricants, specialty industrial oils, and a technical services department and on-site laboratory that ensure only the highest-quality products. Amalie’s state-of-the-art main production facility in Tampa, FL boasts some of the fastest and most sophisticated bottle blow-molding, blending, and packaging equipment available. Amalie blends and packages over 3,000 different products in sizes ranging from 8-ounce plastic bottles through bulk rail transports. We ship products to every State in America and to over 100 foreign countries. In addition to our flagship Amalie line, we blend and package private label products for many of the most technically demanding customers including many international oil companies, automotive retailers, programmed distribution groups, food and drug retailers, and mass merchandisers. Our commitment to cutting-edge lubricant technology led us to advance our product testing through extreme-performance competition engines and race cars since the early 1960's. Amalie continues to earn its racing stripes on the NHRA circuit. Amalie has a large and loyal following in the racing community and the knowledge gained there benefits all of our lubricants. The Amalie story begins in 1903 with the company’s founding in Franklin, PA, by the Sonneborn brothers. It was one of the original "Pennsylvania Crude" oil companies. Amalie was quick to develop a steadfast reputation for high-quality, well-engineered petroleum products. In 1953, Amalie was the first oil company to introduce a multi-grade motor oil: Imperial 10W30. Through the years, Amalie has continued to innovate with synthetic oils, high-TBN fleet lubricants, specialty industrial oils, and a technical services department and on-site laboratory that ensure only the highest-quality products. 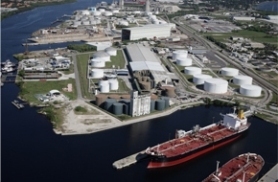 Today Headquartered in Tampa, FL, today, Amalie Oil Company is North America's largest privately held independent blender of motor oils and industrial lubricants. The company offers passenger car oils, heavy duty oils, small engine oils, transmission fluids, gear oils, hydraulic fluids, and greases; and other products, such as power steering fluids, brake fluids, antifreeze/coolants, metal working oils, and refrigerator/compressor oils, as well as special and general industrial products. Amalie produces private brand products for various oil companies, automotive retailers, programmed distribution groups, food and drug retailers, mass merchandisers, and other private label customers. The company offers its products through its online store in the United States and also ships its products internationally, and currently ships to over 100 countries. Amalie Oil Company’s state of the art main production facility boasts some of the fastest and most sophisticated bottle blow-molding, blending, and packaging equipment available. Located on a deep-water dock, and with over about 25 million gallons of bulk storage and blended product storage, Amalie has the economies of scale to economically produce fully-licensed products that meet or exceed the manufacturers' requirements, various sanctioning bodies, as well our customers’ expectations. Amalie blends and packages over 3,000 different products in sizes ranging from 8-ounce plastic bottles through bulk rail transports. We ship products to every State in America and to over 100 foreign countries. In addition to our flagship Amalie line, we blend and package private label products for many of the most technically demanding customers including; many international oil companies, automotive retailers, programmed distribution groups, food and drug retailers, and mass merchandisers. Amalie’s story doesn’t end with quality products at competitive prices today. We are always looking forward and crafting the Amalie brand of tomorrow—how can we better meet our customer needs, and how to deliver a better product to you. Our commitment to cutting-edge lubricant technology led us to product testing in extreme-performance competition engines and racecars since the early 1960's. Amalie continues to earn its racing stripes on the NHRA circuit. Amalie has a large and loyal following in the racing community and the knowledge gained there benefits all of our lubricants. With all of the mergers and consolidations in the lubricant industry, Amalie is one of the few oil companies that still has a distinguished future. Amalie will continue to grow and serve its customers. Amalie will continue to be responsive to customer needs as well as new industry specifications. And most importantly, Amalie is committed to environmental solutions and energy conservation methods. Amalie continues over 100 years of excellence with a full line of Automotive, Fleet, Industrial, and Specialty lubricants, that, since 1903, truly are...Better than they have to be! With over a hundred years of experience and history, Amalie recognizes the value in partnerships as an ongoing commitment to the community. Today, Amalie honors that commitment. •	Since 2000, Amalie has been a proud sponsor of NHRA Top Fuel Driver Terry McMillen. Terry McMillen is the team owner of Hoosier Thunder Motorsports, and has competed in a number of drag racing classes. Personally, he reset his personal best elapsed time and mile per hour records during the 2011 campaign. •	The Tampa Bay Storm is a 5-Time World Champion arena football team. Amalie Oil Company is a proud sponsor and partner of the team. Not only does the Amalie family cheer the team to victory, they also own the naming rights to the Storm field, the Amalie Motor Oil Field. •	Amalie welcomes visitors to the Tampa Bay area with five “Tampa-centric” signs at the Tampa International Airport. Amalie truly wants visitors to enjoy our hometown. •	Amalie has recently entered the Monster Truck arena. With a long list of podium appearances in Mud Racing, Razin Kane was a star in the mud, but the monster truck arena was his real calling. Since 2009, owner/driver J. R. McNeal has been thrilling fans in the monster truck arena. Amalie met and made an instant connection with J. R. and has signed on as one of his sponsors. Now, Razin Kane is out there showing off for his fans and helping prove that Amalie oils are just as tough as JR’s truck—is there a better way to prove durability than drag racing and monster truck charging, snorting and jamming?